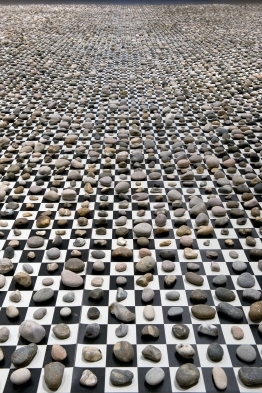 Stones on a black and white grid give new meaning to an ordinary object. Detail of the artist Mark Wallinger’s 10000000000000000, 2012. Design quotes, yay! Good advice in this one, too. If everything’s already been invented, new inventions may need to come from subverting (defamiliarizing) the old ones. Culture-jamming interests me for that reason. SwissMiss runs design quotes. My recent favorite, by Milton Glaser, that has encouraged me to no end: “I move things around until they look right.” If he, of all people, says that, there is yet hope for me. They say there are no more totally original ideas, that the best ideas are new twists on what exists. Somehow I find that more interesting.